Mota Arcade is a gift that keeps on giving when it comes to shopping and we discovered a treasure trove hidden in plain sight! The huge sign demanding attention announcing a massive sale or with deals too good to be true, and we discovered branded clothes you can buy for a steal. A quick glance at Mota Arcade on Brigade will tell you that it’s the thrifty shopper’s paradise, and the basement export surplus store VIVA Fashions is no different. 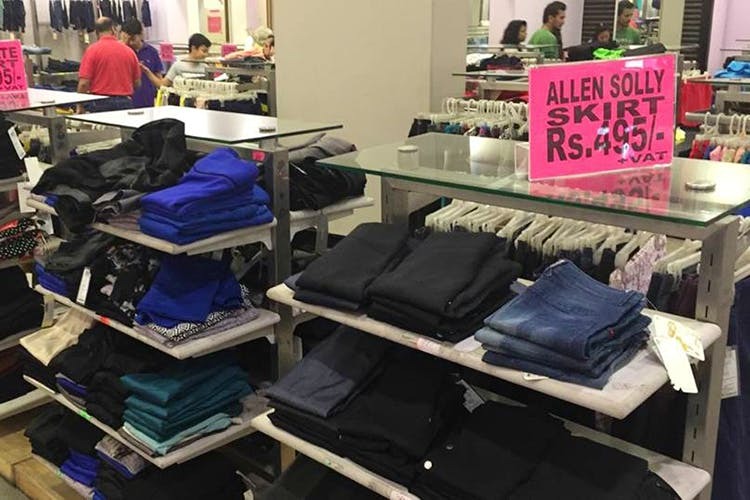 With two entrances, one for men and the other for women, the store displays all the available clothes on hangers for you to browse through brands, sizes, and discount options. The men’s section has everything from comfy cotton boxers to formal blazers hung in storage bags from brands like Puma, Nike, Levi’s, Wrangler, Van Heusen, and Arrow. Their sports brands mostly stock athleisure wear at an affordable rate. Prices for other casual shirts start at INR 399 and INR 499 for formals in conventional colours (blue, pink, green and grey) and styles such as regular and slim fit. The women’s section stocks dresses, tops, skirts, pants and sweaters from brands like AND, Allen Solly, Avirate, Lee and UCB from a few seasons ago. The quality of some of the clothes left us a bit suspicious of their authenticity, but if you’re not too particular and looking at buying something casual for the short term (or you need something new at the end of the month when you’re nearly broke), this is the perfect place for you. Basic sweaters and outerwear that start at INR 799 (and some at 50% off! ), and are perfect for the Bangalore weather. As much as we love this spot though, being an export surplus store also means that their stocks don’t last too long. The brands stocks are subject to availability, so don’t be too surprised if you don’t find the brands that we did, or find something from brands that we haven’t mentioned. The good news is that they take all major credit and debit cards, so don’t worry about carrying cash.